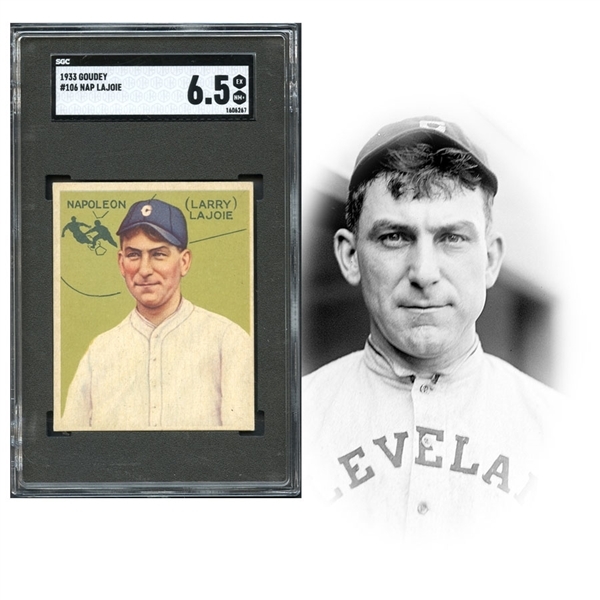 Taking its place among the most coveted sports cards ever issued, the 1933 Goudey Nap Lajoie has a story behind its scarcity every bit as entertaining as those that define the rare T206 Wagner, T206 Plank and 1954 Bowman Ted Williams cards. It all began with the production of the 1933 Goudey series, purported to be a 240-card set but was actually one card short as card #106 was never issued. Knowing collectors would be determined to complete the set, Goudey exploited their clients in an effort to keep the money rolling in. It didn't take long for Goudey's dubious business practice to be discovered and subsequently printed the missing card #106 the next year. But the card was only made available to collectors that had formally complained in writing about the missing card, so the number of examples printed is miniscule compared to other Goudey cards. 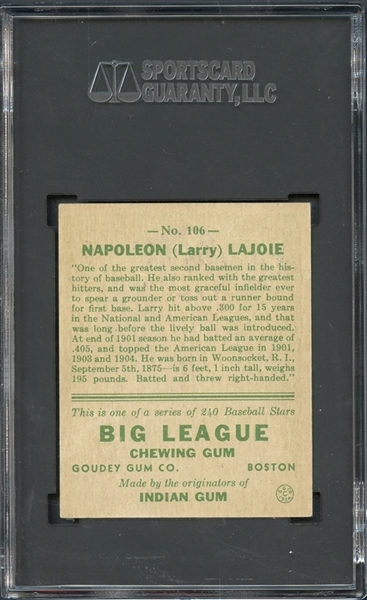 And of those few examples, many are low-grade due to an indentation on the surface, a result of Goudey using a paper clip to attach the card to a "letter of apology." With the 1933 Goudey series becoming one of the most celebrated collections ever produced, the "1933" Goudey #106 Lajoie has become a legendary pasteboard whose legacy, and price, continues to grow with each passing year. Offered is a phenomenal SGC 6.5 EX/NM+ example of one the hobby's greatest creations. 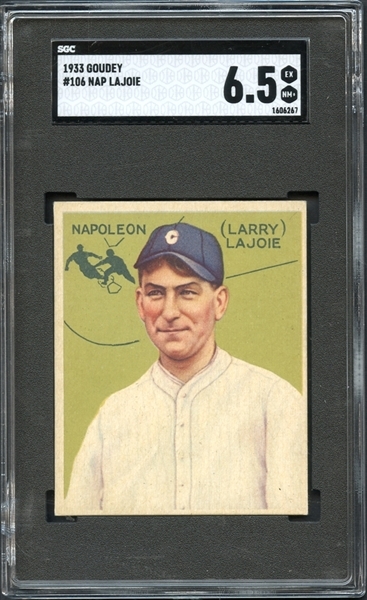 Centered toward the southeast corner but hardly objectionable given the extreme magnitude of the issue, the lime green backdrop that most collectors are only familiar with through photos and scans is robust and bright, capably supporting the sharp and distinct image of Lajoie and matched with a clean, well-printed and moderately toned reverse. The corners appear superior to the overall assessment, compensative for the common centering shift and giving an appearance that can rival any other at its grade level. 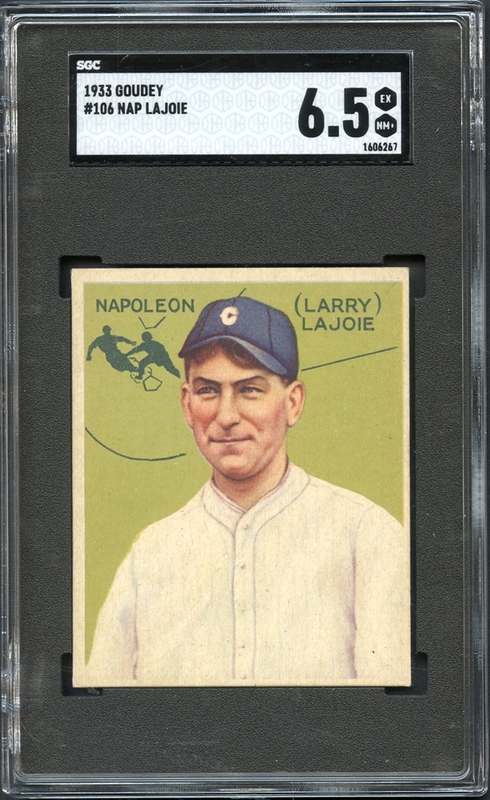 If you're in the market for a '33 Lajoie but have been waiting for the right one to come along, chances are good that this elusive masterpiece we leave you fully satisfied!